Mysterious creature found on planet SR388. For which is thought to also be it's native planet. Also thought to be parasitic. An airborne life form totally capable of flight through it's almost weightlessness. Shortly after hatching, immediately begins to hunt for food. Feeds itself by a highly developed system of consuming the "lifeforce" of its victim. The victim does not loose blood or any other vital fluids, and yet the Metroid extracts energy: identifying this energy is the central problem. It takes no physical form, and yet without it, the victim dies. 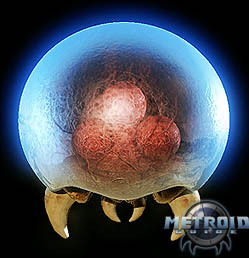 The general basic shape of the Metroid is similar to a typical Cndaria, though on a much more advanced scale. Their bodies are protected by a simple, but effective covering of hardened organic tissue. Through the membranes of this tissue blood is able to flow over the entire surface area of the organism, allowing it to self regulate it's own body temperature. Even still, it does not prevent protection from extreme cold and can infact prove fatal to the Metroid. This outer covering also allows the Metroid to retain a general shape to protect it's inner organs. Within this massive bulb are housed quadripartite nuclei which serve as the power plant for the Metroid. These nuclei are wound in tight bundles that when fully unravelled can reach lengths of over 50ft. As energy is extracted from the victim, twin conduits of electro-tendons transfer the energy into these nuclei. When the Metroid has absorbed more "lifeforce" than it's nuclei can hold, a small field of static electricity has been noted to be surrounding their outer carapace. Metroids have a very fast metabolism and never seem to grow tired of feeding. Some have been observed feeding and feeding without any signs of fatigue.On attacks on humans, they prefer to clamp on to the head, refusing to let go until there prey has been consumed of all energy. Uses its outside tusks to hold and grapple onto prey while its inner fangs draw its prey towards its feeding maw. 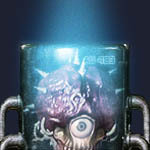 It has a highly developed brain cavity, and is able to problem solve and think. It is so smart that it can tell the difference between the locks on some security doors, leading to a problem.Metroids have never been successfully kept in captivity. Although, scientists have learned by exposing the Metroids to beta rays, the Metroids will multiply, and very fast. In nature, Metroids multiply by ways of being hatched from eggs, laid by a central queen.The unexpected side effect of multiplication through beta ray contact is that the Metroids grow increasingly more unpredictable. They tend to be more easily provoked, have erratic behavior, and tend to feed more often and viciously.The most startling side effect is the growth rate. The beta-exposed metroid will grow as much as 20 times faster then a normal metroid. There size would grow to be enormous, leading to another fear. If a metroid queen where to be exposed to beta rays, then she too would increase in size leaving scientist to wonder: Would her offspring be the same? A metroid queen can produce eggs at an alarming rate. 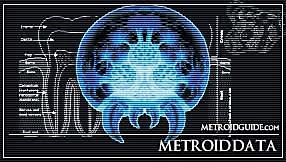 For more info please go to the queen section of the Metroid Biological Information section.